I’m linking up with Franish for my third shopping budget. And I am proud to say that this is the first time I am not ashamed or embarrassed of how much I spent this month. You want to know the worst part about this particular link up? It's seeing everyone elses awesome & super cute purchases. I bought that Jessica Simpson dress after seeing it on Kristina's blog and absolutely falling in love with it on the very first of May. Seriously. It did not bode well for the start of May and my so called goals that I set myself at the end of April. But luckily (or unluckily) the dress was not my cup of tea so back it went. I sent a lot of other stuff back, and sold some things on eBay that I couldn't return. So what did I buy and keep? wow I really like stripes..
1. Target Cami Maxi that I absolutely love! seen here. $25. 2. H&M grey striped top $7. picture is j crew top for $35. 3. Target coral shorts. $18. 4. Target striped dress. $18 Seen here. 5. Lands End chambray skirt off ebay $10. 6 & 7. H&M dresses. $13. These are the same dresses, I already had the black one and I bought a gorgeous emerald green one (not online and couldn't find a picture) and then after Meg told me she had bought the striped dress of Audrey's that I had been coveting for so.long. I raced back to H&M. Unfortunately, I didn't find the exact one, but I did get a striped dress almost identical, the stripes are just a little closer than the photo. So did I meet my goals for the month? Absolutely. I bought less than 10 items, and spent less than $150. Yay! I mean, I think I deserve a medal! Side note: I did not meet my other goals. Oh well! 1. Buy all the things. 2. Eat all of the food. Have a great June everyone! We leave on Thursday!! Not to shabby! Way to go girl. $150 for 10 items you love is not bad at all. And I love all the stripes too! Good luck with your June goals ;) haha! Your June Goals Rock, made me smile! Hahaha I love your June goals! They are perfect. I am noticing a theme! Haha! Love the stripes though. Vacation does mean eat all the things!! LOL...buy all the things and eat all the food:) I think this might be my goal all the months!! Not bad, those are really cute & good deals. I have been on Pinterest and Forever 21 way too long tonight and have convinced myself I need to go to Target tomorrow to look for skirts and dresses, but that could just be the chocolate milk talking. lol I love your June goals! We are on an extreme budget right now. We'll be moving soon and it's going to cost a ton of money. We're moving back home but the company isn't paying for it. While we are EXCITED to go home, we are STRESSED because $$$$$$. There is always good with the bad huh? Loving all the stripes! Way to go on staying within your budget and finding so many cute things. I need to get a shopping budget going for myself as well! ick. I love this post/series that you plan to keep up with. It's motivating to see someone be a thrifty shopper. And it's fun to see what you buy! Well I think you did fabulous with shopping on a budget! I love your comment abotu how the worst part about the linkup is seeing what cute stuff others buy! Lol. I'm scared to see what damage I would do if I kept track of my purchases and looked back on them. Lol. LOL I love your June goals! Way to stay on budget! 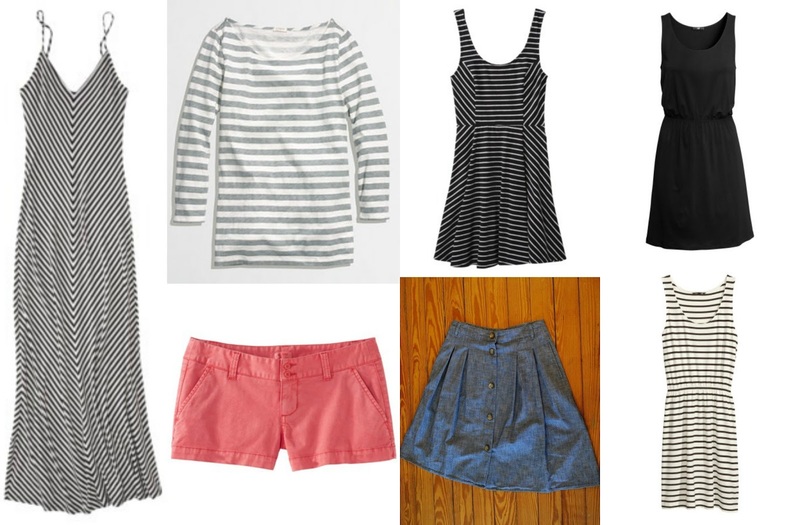 I love those H&M dresses, they are so perfect for summer! And I am the same way, looking at the budget posts just makes me want to buy clothes other bloggers got! you picked up some great pieces this month! they're all gonna be sooo versatile, well done...and I want that J. Crew factory striped shirt. Maybe I'll find it on sale when I go to the outlets? btw have fun in Australia~I can't wait to see all the posts!